For determining the DBMS of the year, we subtracted the popularity scores of January 2013 from the latest scores one year later. We use the difference of these numbers, rather than a percentage, because that would favor systems with a tiny popularity at the beginning of the year. The result is a list of DBMSs sorted by how much they managed to increase their popularity in 2013, or in other words, how many additional people started to communicate about it in one of the ways we measure in our methodology, for example job offers, professional profile entries and citations on the web. At the beginning of 2013 MongoDB was at rank 7 with a score of 96.1. It overtook Microsoft Access in August, climbing to rank 6. Now its score is 178.2, which is a gain of 82.1 points and makes it the best performing system out of more than 200 DBMSs in our ranking. MongoDB is a Document Store, the most popular NoSQL system, and a major force in the whole NoSQL community. MongoDB lists scalability, performance and high availability as its main strengths. It is an open source system, but an Enterprise edition with additional functionality is available as well. MongoDB Inc. is a well-funded company with offices in USA, Europe, Asia and Australia. Second in the list of popularity gains is PostgreSQL, a well-established relational DBMS. PostgreSQL is also an open source system with a very active and enthusiastic community. PostgreSQL moved up to rank 4 in our ranking in March 2013 and has established itself as a strong competitor not only to MySQL, the leading open source DBMS, but also to commercial RDBMSs such as Oracle, Microsoft SQL Server and DB2. Third is Cassandra, the leading Wide Column Store. Cassandra made it into the overall top 10 in September, and has since further increased its popularity. Cassandra is an Apache open source system, backed by DataStax, which is also offering an Enterprise edition. Similar to MongoDB, Cassandra is focusing on applications that require scalability and high availability, however the underlying concepts are quite different. 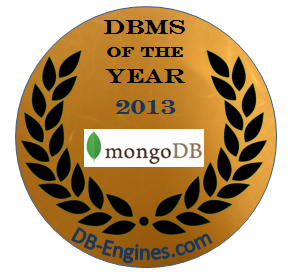 We congratulate MongoDB, PostgreSQL and Cassandra for their extraordinary achievements in 2013. The DBMS field is evolving very rapidly nowadays, and these three systems have managed to provide great technologies that more and more developers love to use. The fact that we have three open source tools and two NoSQL systems amongst the winners may be an indication of what 2014 has in store for us. Max Schireson, CEO, MongoDB: "We are excited to see how developers are reacting to MongoDB’s ease of use. Their support of the project and the overall success of MongoDB to date allow us to increase our R&D investment, focusing on improving MongoDB's scalability, concurrency, robustness and management tools. These investments will benefit existing MongoDB users as well as attract more users and complementary vendors to the MongoDB ecosystem." Billy Bosworth, CEO, DataStax: "For those of us in technology excited about reinventing the technology world, it is great to see the huge growth in Cassandra's popularity. It was just a few years ago that we at DataStax saw the possibility of an era of change the likes of which only come once every several decades. In 2013, we watched this possibility move from theory to fact. The results show that the time of change is no longer around the corner. It is upon us now."